In Open Office's database, "Base"
Page contents © TK Boyd, Sheepdog Software, 10/12. Often in database work, I find that if you concentrate on what the database is designed to do, rather than what you want, you make interesting progress. Take for example the "functions" (average, sum, count, minimum, etc) which are tantalizingly indicated if you look at the "functions" row of a query design. In this essay, I am going to show you those functions in action. Once you have learned the capabilities provided they provide, you may start realizing things that you now want to do with a database... and even have some idea of how to do them! For a moment, try not to think too much about what you would use the functions and grouping tools for. Just concentrate on "What can the database software do?" It is very easy to let your mind drift, and imagine that the software will do things you might want it to do, even though it doesn't do that, and thus distract yourself from what you are supposed to be learning about what it actually can do. Continuing with that. Suppose you were learning about carpentry, and the instructor was talking about what a hammer can do. If your mind wanders, and you start thinking about screws, before long, you'll be imagining driving screws with the hammer. As ever, a little grist for the mill will be helpful. For this tutorial, I went off to Wikipedia and collected some data about towns in the US. I harvested records for every town in Massachusetts, Connecticut, Vermont and New York... every town in those states with a population of more than 29,999, that is. You can download that database with town populations and a few stray other facts, zipped up with a ReadMe text file. If you do it on 26 Oct 12, it may well be incomplete, as I am still writing this tutoria1!... but the basic table is already there. That's the sort of data we will work with. What can we do with it? This tutorial isn't in the "Level 3" group for nothing! I've had a frustrating several hours just roughing it out for you. There are things that don't quite make sense to me. 3) But, none-the-less benefit from it! If only for ideas sparked! It certainly won't give you "all the answers", nor even, I suspect, 100% right "answers"! Food for thought, and temptations to try things, at least, though, I hope! There are four cities in MA with between 30,999 and 32,000 residents. As I said, some of those examples are strained. However, if you were applying the same tools to different data, things like "the maximum field value found in this group" would be interesting. And, to finish off this section, one little bit of good news. You deserve a reward by now, don't you think? The good news is that you don't always have to group records in order to use a function. You could, for instance, have the simple total population of all the towns. (I'll show you how to get this. The query is called "queryTotalOfAll". (It has been written to total the town populations in the "Subset" table.) I've also included a report in the database which reports the same information, with a little "stuff" added, and the presentation tweaked. The report is called "repTotalOfAll"
For this essay, we are only going to look at grouping in queries. I believe grouping is possible in other contexts, in particular in reports... or am I just remembering that a report can be based on a query which is doing some grouping? Certainly that sort of report is possible... I'll show you two! We will now make a query which will look at the records in the table "Subset". You'd use the same techniques if looking at the larger table. You can use either the new query wizard, or the "Create Query In Design View" option. In any case, you will eventually be working in the Design View, as that is how you edit a query, to get it be "just right". For creating a table, I think the wizard is more trouble than it is worth. But the wizards can, sometimes, be helpful "hand holding" for the beginner. We'll create a query which will group the records by what's in the "State" field. It will also add up the populations of the towns, group by group. We'll start the query with the wizard. Open Office can give you such a report... but not with a simple query! A query returns a table. In a table, all rows and columns are "equal".... you can't have "special" rows like the ones with the totals for each state. (Well, you can have one "special row" at the top, if you want to consider the row with the labels for the columns as part of the table- resulting- from- the- query. But it isn't really part of the table. It is merely labels for the table's columns. Because we want to "do things" with our groups of records, we have to give up, here, seeing the individual records used to determine each result. In this case, to determine each sub-total. While we will often, for other purposes, want to see the individual records, we can't, if we want to use the functions. Invoke "Use Wizard to Create Query"
Step 1: Tell the wizard that you want to use table "Subset". Put fields "Pop" and "State" in the "Fields in Query" list. Those are the only ones we're using. Leave "ID" and "Town" out, or you will have problems. You can try to set the order of the columns in the resulting table by the following... but it may not work. If it doesn't, you can fix things in the query design window by rearranging the columns. Either select "State" first, and then "Pop", or use the "up" and "down" buttons to put the fields in that order in the "Fields in Query" list after both are there. Step 2: We don't NEED to impose any sorting, but you may want to sort the results by "State". There's no point in sorting by "Pop", because we will not be seeing individual records. Step 3: Search conditions: None. That isn't to say you would never have any, if setting up a "Summary" query. We're just skipping that extra complication today. Step 7: Aliases: This step allows us to determine the column headings. Each column is associated with a field, and there's a proposed heading, alias, for that field already filled in. You can change the headings. In this instance, it makes sense to change the heading for the column associated with Subset.Pop to "Total population of mid-sized towns in state". (If you agree that "mid-size" is a reasonable description for "towns of between 29,999 and 40,000 souls." Step 8: Overview: After you give the query a good name, I used "queryPopSummary" just click "Finish"... but don't be alarmed! Our result is imperfect. Close it. Right-click on the query just created. Click on "Edit", and you will have the query up for editing. In the "state" column, in the lower part of the design window, the box for "Visible" is not ticked. Add a tick. Run the query again, within the design tool, using the icon in the toolbar. (Or the menu: Edit/Run query. (Or F5!)). You'll see the revised result at the top of the design tool window. If the columns in the result from the query were not in the order you wanted, you can rearrange them just by dragging the plain gry rectangle just above the "Field" row of any column in the editor display. In the database you can download, you'll find a report called reportTotalOfAll. It is very little more than the results of the query we just created... but the result is presented in a "wrapper" with some text explaining what is in the table at the heart of the report. While I am a great fan of the Report Builder add-on, for something simple like repTotalOfAll, you don't need it. Step 1: Select the query we just made, queryPopSummary, and tell the wizard to use all of the fields of the query in the report. Step 2: The default labels will be fine. We can alter them later, anyway. 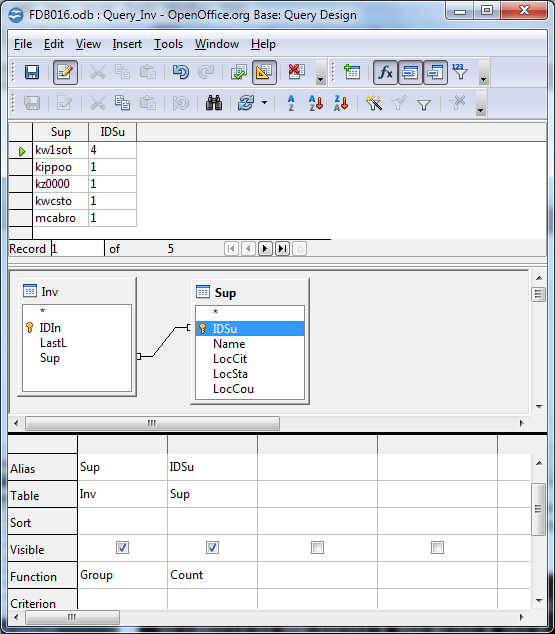 Step 3: Grouping: Tell the wizard to group by the data in the "State" field. Step 4: It would probably be as well to sort the results by "State". Step 5: Layout. I just used the default. Step 6: Be sure the name the report will have is satisfactory. I changed the default, made it "reportTotalsByState". The pros and cons of "static" vs "dynamic" reports are discussed in a different tutorial on my site. For now, elect "dynamic". That presentation gets, perhaps, a bit "over the top" for a simple little table of the populations of the mid-sized towns in each state. Though I haven't time to go into details here, in the .zip file you will find a form called formPopByState which embeds the results of the query, presenting them in yet another manner. I don't know about you... but I am exhausted.... and out of time. ... and then "work our grouping magic" on that. Should be simple... right? Sigh. The following shows the design of a query which can produce the results showing at the top. It is from a stock control database. The "Inv" table lists one invoice per record. The "Sup" table lists one supplier per record. The query tabulates how many invoices are present from each supplier. I.e., according to what we see at the top of the query design window, there were 4 invoices in the database from supplier "kw1sot", and one invoice from each of the other four suppliers. ... for helping and inspiring me. There is more Good Stuff there!